Today, my lesson plan changed last minute (like, literally 10 minutes before the kids came in for the day) and it went pretty well, so I thought I would share what we did with you. 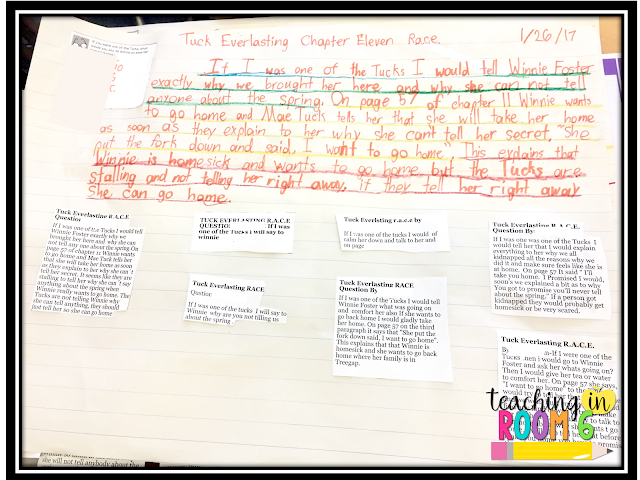 We have been using the RACE strategy to respond to comprehension questions about our reading. 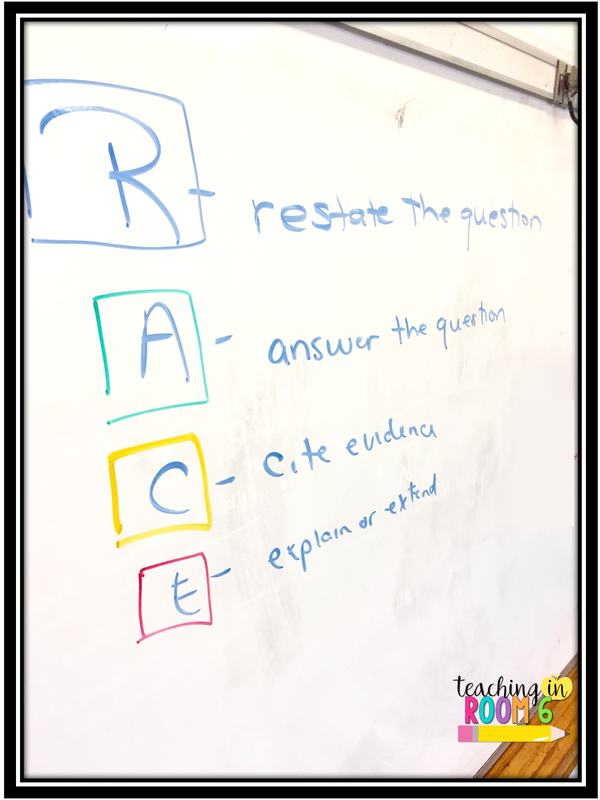 If you aren't familiar with the RACE strategy, here is a great post by Becky at Create.Teach.Share (she also has a wonderful freebie that I used to introduce this concept to my kids.) I wanted the kids to practice the strategy, read the next chapter in our book, and use the computers this morning (since I had totally forgotten we had the cart, hence my lesson plan change.) So, to do this, here is what we did. I broke the kids up into groups. 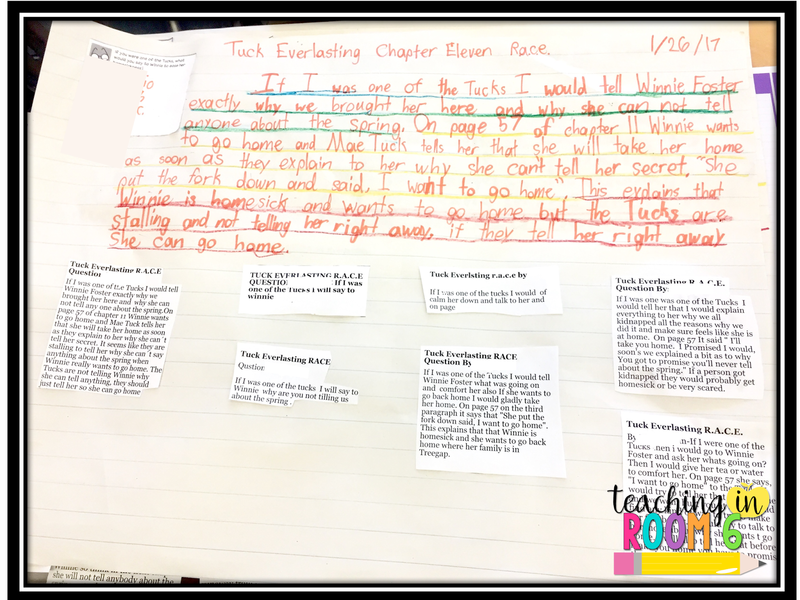 Each group was to read the assigned chapter of the book in any way they wanted (silently, in pairs, as a group...it really was up to them) and discuss the chapter as they were reading. I honestly was amazed that they actually did stop to discuss during the reading without any prompting from me! But they did and it was awesome. Then, the students signed onto their Google Classroom feed where I had included a link to a Padlet that I set up for them. 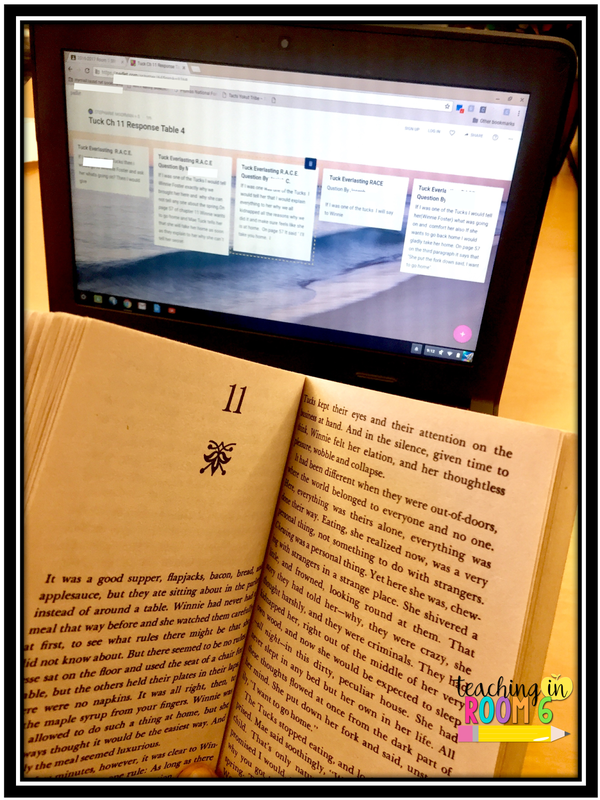 Since GC now has an awesome new feature that allows you to assign things to groups of students instead of the entire class, I created 5 separate Padlets and 5 separate assignments on the feed. When the kids opened their GC feed, only their assignment was there. The kids went to the Padlet and used the RACE strategy on their own to answer one deep, text dependent question that I assigned them. 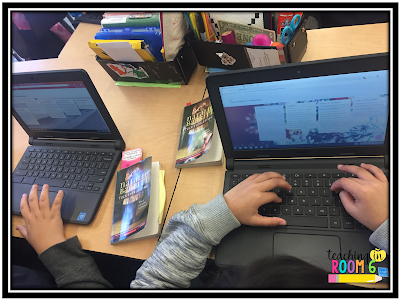 The beauty of Padlet is that all the kids can see each other's answers and adjust their own, while still working. Next, after all the students in the group felt like they answered the question well enough, pulling text evidence and restating the question in their own words, the students worked together to create ONE final answer to represent the group that really answered the question using the RACE strategy. I asked them to write those final answers on a chart paper, underlining each part of the RACE strategy in a specific color. We then presented them to the class. All in all, this lesson, while taking longer than I anticipated, was a good way to get buy in from all the kids and have them work collaboratively. I think I did make my groups too large and would have cut them down to about 4 per group instead of the 6-8 that were actually in the groups (I only had 5 questions, so I needed 5 groups....I would double up on the questions next time to make the groups smaller.) In addition to the group responses, I like how I have the Padlet so that I can go over each individual answer to see who understands the RACE strategy and who is still struggling. What is one way you have the students show their understanding of the RACE strategy? Stephanie, this is awesome! I LOVE Padlet and use it all the time! We also use Hapara and it's great to send out group assignments! I really like how you tied in RACE with the novel and tech! I think I will be stealing this idea! 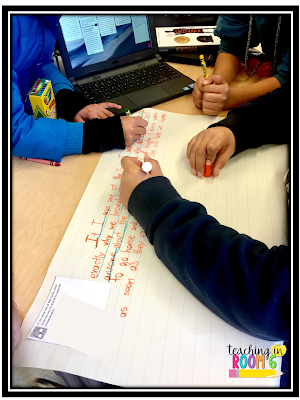 I love how you had them write their responses on chart paper to showcase their work. I use the RACE strategy all the time and find that it's definitely helpful in writing well thought-out answers! Often times, I post a question on Google Classroom and have students comment on the stream using RACE. This also allows students to see others' posts and respond to one another. However, I am not familiar with Padlet and I would love to incorporate more technology in my classroom. How is it different from Google Classroom? Hi Stephanie, I love your posts. I am wondering how you use the new feature in Google Classroom that allows you to assign things to groups of students instead of the entire class. I am unable to find information on how to do this. There is a little pull down menu when you are assigning the task that says, "All students" or lets you choose the kids. It is on the assignment tab, the one where you put the name of the assignment and attach the docs and stuff.